Hey friends! I know you usually don't hear from me on a Saturday, but it's 6 weeks until Christmas so all rules are out the window…right? 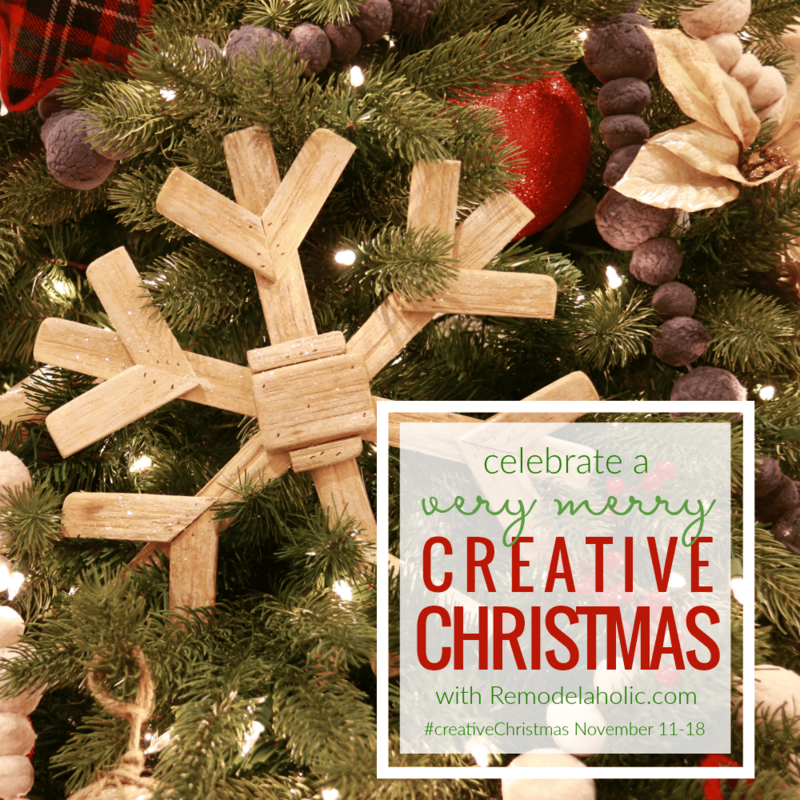 I am thrilled to be joining the Creative Christmas Challenge hosted by Remodelaholic this year! This challenge is the kick-off of their #CreativeChristmas series, which will include many more projects and tutorials. Twenty-six creatives are sharing Christmas ideas for your crafting enjoyment! Make sure you take a little time for a virtual creative fieldtrip by checking out the other posts listed towards the bottom. I have been ruminating on this craft for several months, ever since I made the little ‘milk bottle' jars from recycled Starbucks Frappuccino bottles; so was excited to put my idea in motion for this Creative Christmas Challenge. And what great little gifts they make…I've already sent one of my DIY Gingerbread Man Candles home with a friend! Candle Wax. (I used ArtMinds Soy Flakes that I purchased at my local Michael's, but I don't see that they sell it on line.) The 4 lb bag I used made 8 candles. Thermometer. I used my kitchen thermometer, but there are candle thermometers. I used my Cricut Explore Air 2 to cut the Gingerbread Man stencil. I used the so charming Gingerbread Man image from the Christmas Design Elements bundle that I purchased a year ago from The HungryJPEG. Huge Disclaimer here…These were the firsts candles I ever made…I'm pretty sure I probably broke several candle making rules in the process, but it worked for me. For what it's worth, I did read about the process and watched some videos, so I didn't just jump in blind…like I have been known to do from time to time. ? Clean your bottles of their labels and then run them through the dishwasher. The rubbing alcohol will get the little expiration date stamp off as well. Make sure they are completely dry on the inside. I actually put mine upside down in a colander over my air register to blow some air in them to make sure they were dry. Measure out your wax and place it in your pot. For the soy flakes I used, it took 2 heaping cups of flakes for each 10-ounce candle…filled almost to the top of the bottle. Place a colander big enough for your wax pot in another pot of simmering water. Place your wax pot into the colander. While your wax is melting, place your bottle in a warm oven 175-180°. I know with the fragrance I used, it needed to be added to the wax when the wax reached a temperature of 185°. Check with your scent manufacturer to find the flash point of your fragrance and that's the temp that your wax should be. The dye should also be added when your wax temperature is 185°. I added 2 teaspoons of fragrance for each candle. I added 3 drops of brown and 1/3 of an inch of the yellow dye rectangle for each candle. Stir for a full 2 minutes to fully incorporate the fragrance and the dye. I used bamboo skewers to stir. Drop a little bit of the colored wax onto a sheet of white paper to get a good idea of the color your dried wax will be and adjust accordingly. I found that the brown right out of the bottle was too pink for what I wanted, so I added a little bit of the yellow dye to balance that. When your wax is close to 150°, remove your bottles from the oven and adhere the wicks to the bottom of the bottles with wax adhesive. I found a shishkabob skewer helpful to push the tab firmly to the bottom of the bottle. Pour the wax into your bottles, reserving a small amount (like 1-2 tablespoons per candle) for what is called a ‘second pour'. The second pour is needed as a small divot will most likely form right around your wick. The thin second pour will fill that divot and level off your candle. Set the pot with your reserved wax aside…you'll heat it up again several hours later. Using bamboo skewers, pencils, or something similar, align your wick so that it in the center of your bottle. Prop it with the skewers and set it aside where it won't be disturbed for several hours. If you fiddle with the wick once it starts drying, you will make a mess…ask me how I know. Once your candles are cooled, heat up that small amount of reserved wax and pour it over your candles to level them off. Once the candles were cooled, I uploaded a the Gingerbread Man image from my font bundle. If you have never uploaded an image to Cricut, here's a video I did earlier this year showing how easy it is. For this Gingerbread Man, I used the Complex Image setting in the edit menu. I resized my Gingerbread Man such that he was 2″ tall and 1.5″ wide. Then it was just a matter of weeding the image and applying it to the candle bottle. I did clean the bottle with rubbing alcohol before I applied the image…you will find that the soy flakes are a little greasy. I marked up one inch from the bottom of my bottles so that my men were all in the same place on the bottle. I tied a little ribbon around the top and (dusting off her hands) “Done and Done”. I know it seems like a whole bunch of steps, but it really is an easy process. You could easily whip out a bunch of these in a couple of hours…most of the time spent with the wax either melting or cooling…not a whole bunch of hands-on time. OH! Yikes, I almost forgot. I did a video showing how to make the DIY Gingerbread Man Candles from start to finish….well…I did fast forward through melting wax, cooling wax and weeding a white image off of a white background. If you have sleep problems, let me know and I'll send you those outtakes! So, as I mentioned, I am participating in the #CreativeChristmas Challenge hosted by Remodelaholic. Do take some time to pop into these other bloggers for a little Christmas Craft eye candy! If you think you might want to give these DIY Gingerbread Man Candles a try, then bookmark this page or pin this image for your future reference. Your gingerbread candles are a cute gift idea! I’m visually oriented so loved watching the video tutorial which made the process more “doable.” And it was fun to “see” you at work. Great explanations and demos, Lynn! Hope all is well with all of you! Hi Lynn, these are such a cute idea as an easy but thoughtful gift. And recycling the old bottles is perfect reuse for them. Those sweet gingerbread men on the front are awesome! Hi Lynn! 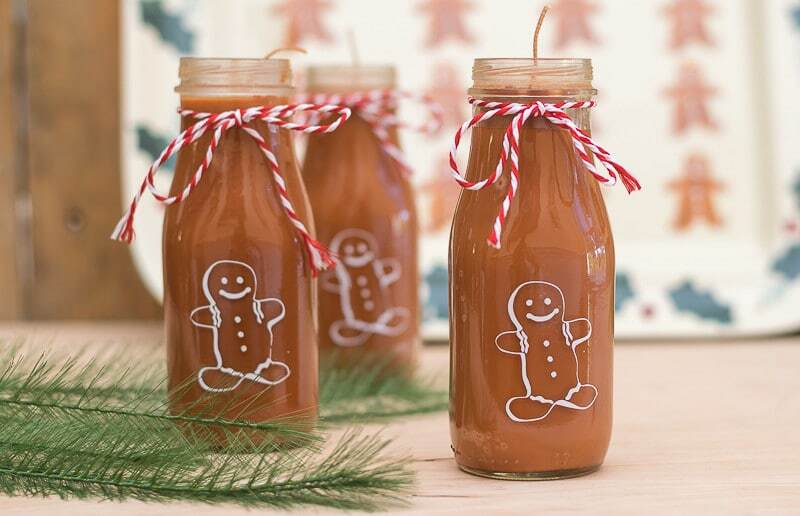 These candles are adorable and who doesn’t love anything with gingerbread men? These would look so cute in the kitchen. I really appreciate you taking the time to make a video so that we can make these too. Great tutorial!